The Headers Of This Rotary Engine Glow Red During This Wild Engine Dyno! In this video we get a first hand example of how quickly air goes in and out of highly efficient engine. When the super heated exhaust leaves the confines of the inside of the rotary it creates so much heat that it turns the headers a bright, intense glowing shade of red! We watch as the process slowly takes place and it is truly amazing seeing the change in color from the normal solid grey headers to the blazing red outcome. To watch the intense process take place right before your eyes click the video below. If you want to get straight to the color changing action skip to the 20 second mark, but we have to say it is even better watching from the beginning. ENJOY! Beautiful Model Jelacy Test Drives A 1000Hp Silverado Truck! 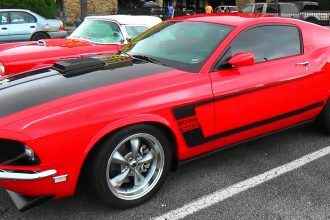 AMAZING 2007 Mustang Converted Into A 69 Boss Mustang!